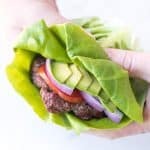 Perfect Paleo + Whole30 Burger Recipe with a Homemade Worcestershire Sauce – the secret to the most flavorful and juicy paleo + whole30 hamburgers! Gluten free, grain free, dairy free, soy free, sugar free, low carb, keto, real food, clean eating. Are you ready for the most flavorful, perfect, juicy burger patty of your life? One of my biggest cravings this pregnancy has been red meat. I can’t get enough! We’ve been having these burgers once a week for probably 3 months, and usually a steak or tri tip or meatball dinner too. 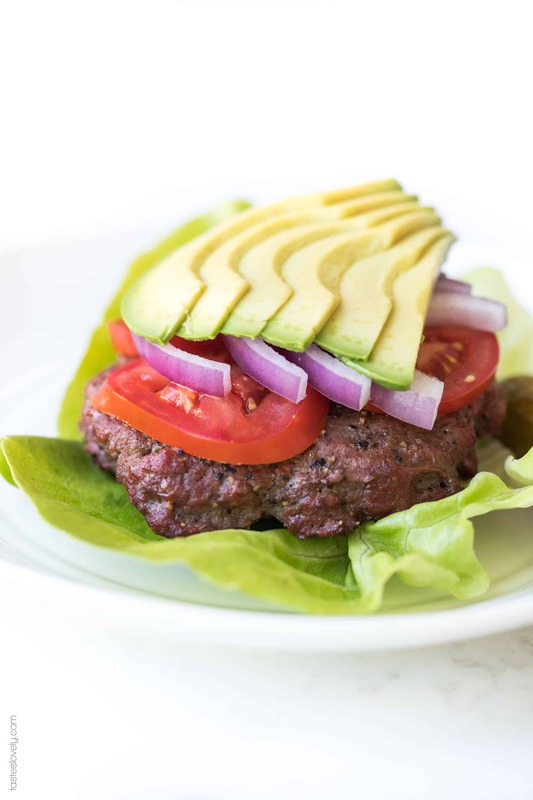 After making them so many times, I have perfected the perfect paleo + whole30 burger. First, you want to start out with really high quality ground beef. I get grass fed, organic ground beef. No junk meat here! I prefer 85% lean. 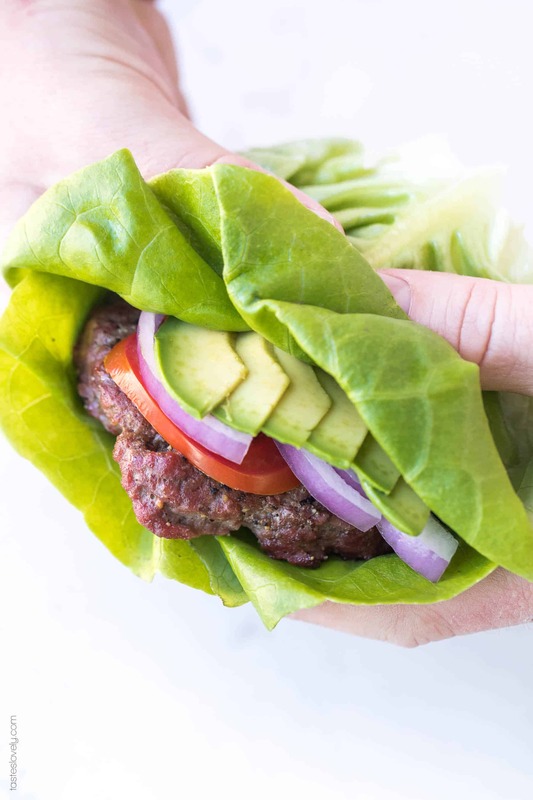 For really juicy paleo + whole30 burgers, you want to be gently with the ground beef. Don’t mix it up at all with your hands. It will get too tight and tough and firm. I just take it right out of the packing container, divide it into the number of patties I’m going to make, then press them into patties. Then simply sprinkle the tops with salt and pepper. Then throw them on the grill (or use your indoor grill pan). Remember that homemade paleo + Whole30 worcestershire sauce I shared last week. That is the other major secret to these incredibly flavorful burgers! Do not skip this ingredient! It takes just 5 minutes to make, and the amount of flavor it is going to add to your burgers will blow your mind. It boosts that amazing umami flavor you love about red meat. Once the burgers are on the grill, I drizzle the tops of each patty with half a tablespoon of the worcestershire sauce. I flip the burgers just once, then drizzle the other side with another half tablespoon of worcestershire sauce. Once they’re done cooking to medium rare (145ºF using an instant read meat thermometer), I let them rest for 5 minutes before eating them. This lets the juices redistribute in the burger, rather than squeezing all out as you eat it. 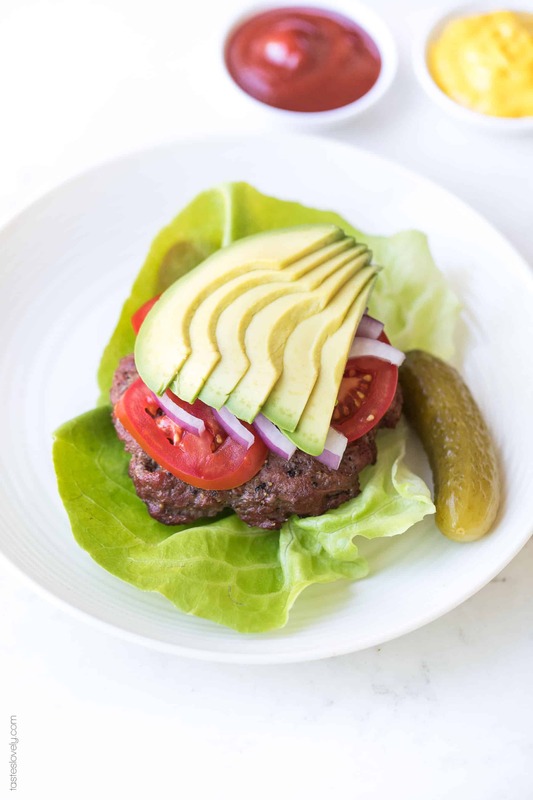 I serve these paleo + whole30 burgers on butter lettuce “buns” topped with some of my homemade paleo + whole30 ketchup, sliced tomatoes, sliced onions, avocado and a dill pickle. Actually, more like 4 pickles, *wink*. I’m 8 months pregnant, can you blame me? 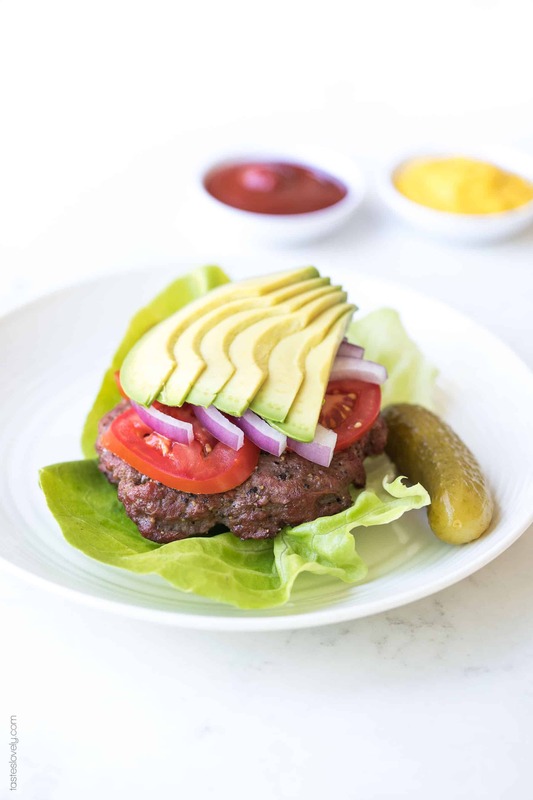 You’re going to love the amazing flavor of these burgers, and love even more how healthy they are! Paleo, whole30, keto, gluten free, grain free, dairy free, sugar free, soy free, clean eating, real food. Your favorite toppings such as: sliced tomatoes, sliced red onions, sliced avocado, paleo + whole30 homemade ketchup, paleo + whole30 homemade mayonnaise, yellow mustard, dill pickles, etc. Preheat your outdoor grill (or indoor grill pan) over medium high heat. Divide the meat into 1/4ths, and form the burger patties. (See the Notes below for my great hack of forming the perfect patties!). Season each patty with 1/4 teaspoon salt and 1/4 teaspoon pepper. 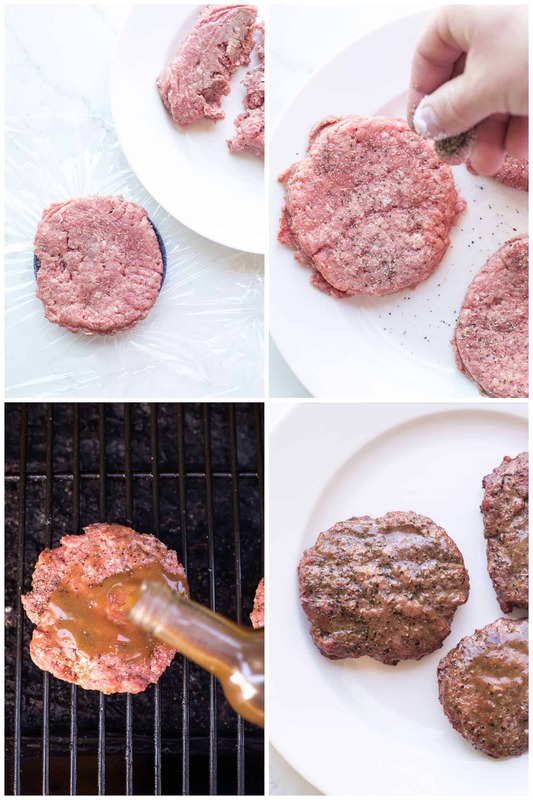 Place the burger patties on the grill, and top each patty with 1/2 tablespoon of the worcestershire sauce. Grill for 5-6 minutes, flip, and top the other side with 1/2 tablespoon of worcestershire sauce. Continue to cook until the burgers reach an internal temperature of 145ºF for medium rare, or 160ºF for medium on an instant read meat thermometer. Also, never press your patties as they’re cooking! You’ll squeeze all the flavorful juiciness out them. Be gentle with them. Remove from heat, and allow to rest for 5 minutes. Serve on lettuce “buns” with favorite toppings. I have a great hack to form the perfect burger patty! I saved the lid to one of those huge containers of nuts from Costco, and it is the perfect size to form a 1/3 pound burger patty. I line the lid with saran wrap, press in the ground beef, lift it out and there you have it! You can also use a burger patty press. Ok, these seriously were amazing! We made them over Memorial Day Weekend, and my husband grilled them to perfection. I served them in iceberg lettuce, like In-n-out does. Delicious!